“One day I’d like a small piece of your work.” Those words floated above our work from somewhere in the mid-70’s until 1982. They were spoken by Marie Friedman, one of the finest miniature craftspeople we would ever meet. She worked in glass, metal, leather, porcelain, all in incredibly fine detail. For years Marie built our mini-light fixtures with hand-blown glass shades, set in brass fixtures she also made, and wired, but she always refused our money in exchange. She also made us chandeliers and sconces with cranberry glass shades—the color comes from gold oxide being mixed with the molten glass. We couldn’t use her miniature porcelain dishware, so she made porcelain tiles for our floors and fireplace surrounds. She just enjoyed being part of our work. Every time we asked about what she wanted, she’d just smile and tell us not worry about it—she’d know someday. During those years we got in a lot of long evenings of conversation over dinner (many cooked by her husband Norm, who made superb, fresh and off-the-grid Chinese dishes) at her home in Portland, hoping to coax a project out of her. Finally, in early 1982, she asked us to Portland to see her latest creation, a graceful, cranberry glass chandelier, each shade framed in gold filigree, hung from a long brass stem. And she had a box of tiny tiles, each embellished in a cranberry and gold design. 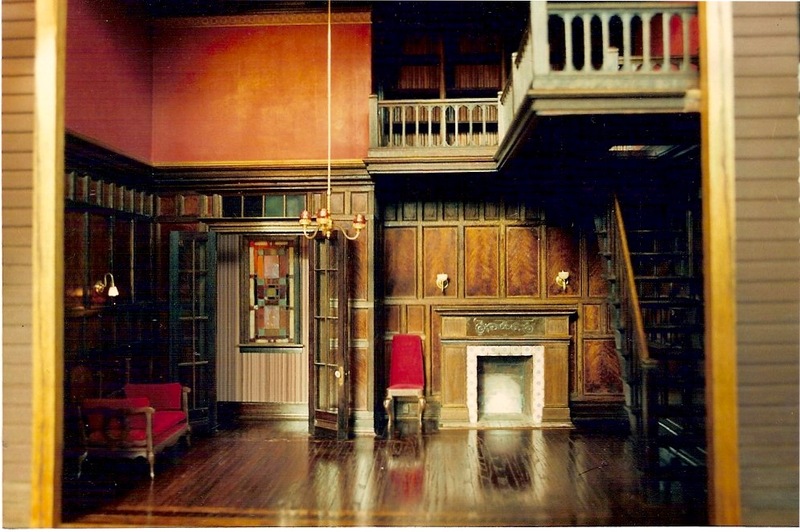 She wanted a library room to house her chandelier, with a fireplace bordered in the tiles. She thought some dark wood paneling would be nice, too, but the rest was up to us. We loved the idea of tackling a single room—the trouble with building houses was that the exterior work always predominated, and this time we could focus on an interior. Of course it had to be a spectacular interior, up to the standards of Marie’s meticulous work. And, this smaller piece was just the breather we needed after having spent two years creating our three most elaborate Victorians. 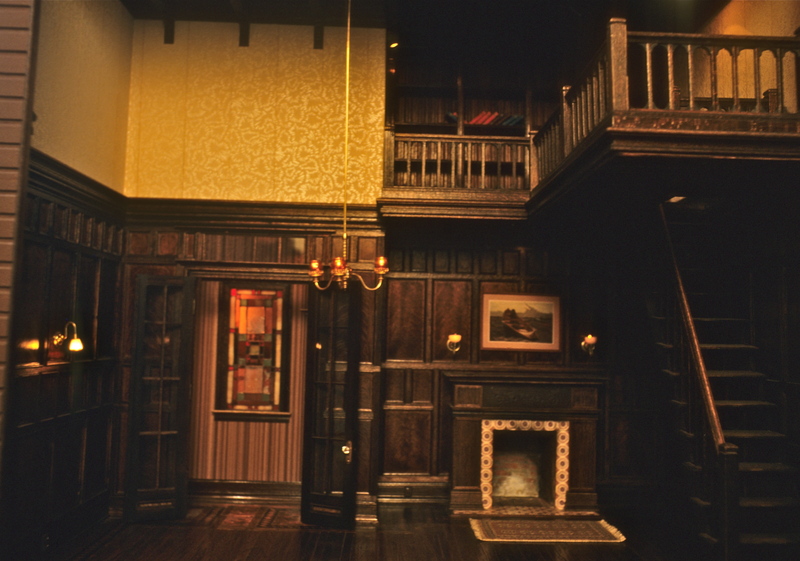 The paneling would make the room dark, we didn’t want a window in a library, and couldn’t light a fire in the fireplace, so our focus became using every possible means to create warmth and bounce as much light around as possible. I always thought formal libraries should feel warm and inviting, like well-used gloves, and I wanted to make that in miniature. In lieu of a window in the room, we stole a Eugene Kupjack trick by having a door at the back of the room, open to a hallway with a copper-foil stained glass window, which we could light from in front and behind. Noel spent a lot of time on that window, working to build something that would compliment Marie’s chandelier without detracting from it. The door, too, is glass, again for its reflective quality as well as transparency. Initially, for the upper walls, we decided on a light-reflective wallpaper above the dark paneling—an antique off-white with a silver design. 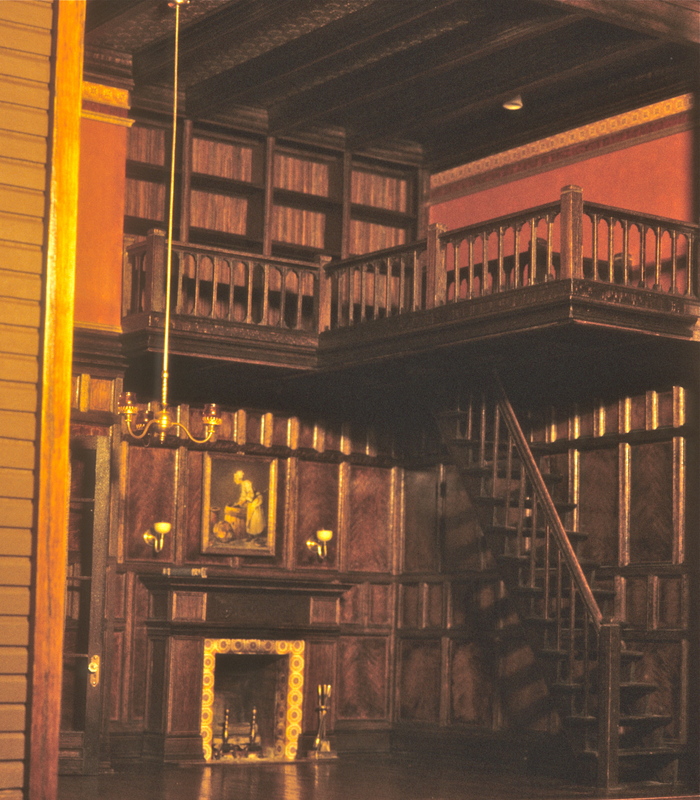 The paper also surrounded the upper gallery of the room, drawing the eye up the stairs. 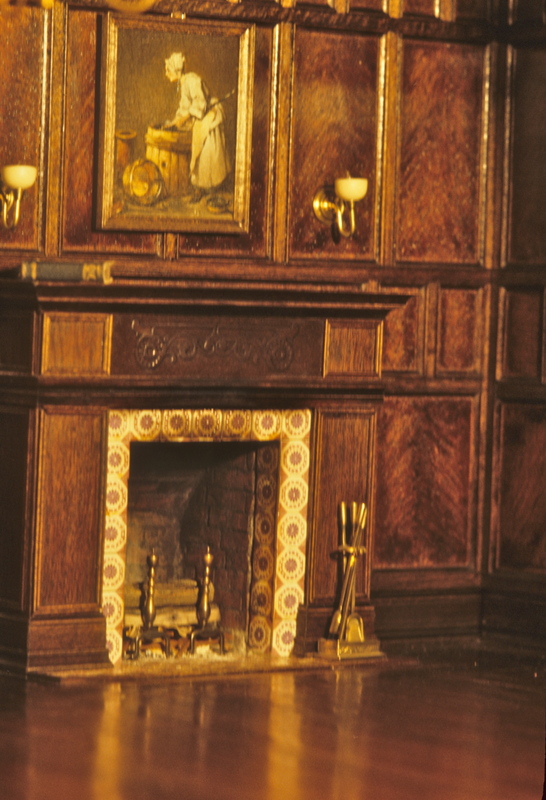 Years later, after Marie’s death, when this room was acquired by another collector, she asked us to re-think the wallpaper—she thought it didn’t fit the room. After we settled down our bristles, we realized how right she was, and went back in to paint the wall a deep cranberry, ragged on so that highlights from the original paper would show through. Then we bordered it in gold, and the whole room bloomed into what it should have been. Marie seemed immensely pleased with our “worst,” and we celebrated the completion of the project a few months later over yet another of Norm’s spectacular Chinese meals. That was the night she announced she’d decided to give up miniatures for a new love—the study of Chinese language and culture, in China. She died of cancer a handful of years later, but only after spending enough time in China to learn multiple dialects, and “adopt” several Chinese students who came to college in this country. She lived a fuller life than most. My only regret is that she didn’t get to see the library in its best incarnation, with the deep cranberry walls. Aside | This entry was posted in Houses, Miniatures and tagged dollhouses, miniatures, Victorian architecture. Bookmark the permalink. Thank you for sharing Marie Friedman with us. The library is wonderful. I had the good fortune of acquiring many of her porcelain dishes and tiles. I treasure them. What a talented lady! !